CPPs new Midnite Series booster combos are available for street rods, custom cars as well as vehicle specific applications. We offer complete kits with booster and master cylinder, proportional valve and mounting brackets. 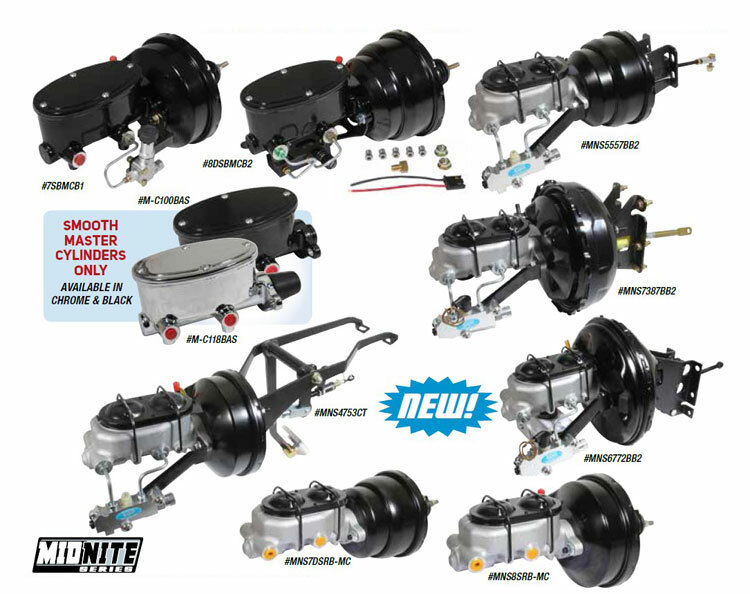 Kits feature either our aluminum master cylinder or our newest Midnite Series black aluminum master. M-C100BAS 1" bore; 2 port 1/2-20; 9/16-18 thread, ea. M-C118BAS 1-1/8" bore; 2 port 1/2-20; 9/16-18 thread, ea. M-C100CAS Chrome, 1 Bore; 1/2-20; 9/16-18 thread, ea. M-C118CAS Chrome, 1-1/8 Bore; 1/2-20; 9/16-18 thread, ea. M-C100-APLF 1" bore aluminum cast master cylinder, ea. M-C118-APLF 1-1/8" bore aluminum cast master cylinder, ea. M-C100-APBLF 1" bore aluminum cast master cylinder with black top, ea. M-C118-APBLF 1-1/8" bore aluminum cast master cylinder with black top, ea.